This comfortable cantilever chair is based on a modern design criteria. Classic elegance for conferences, meetings or executive applications. The chair’s shape excels with informality and positions it in the minimalist Zeitgeist. The Dexter provides superior seating comfort. 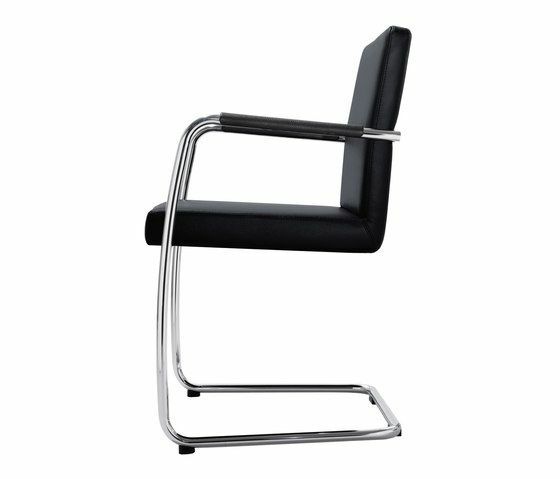 With its classic and yet modern style, the cantilever chair can be used in all representative communication areas in the office. The seat and backrest of the cantilever chair are upholstered – optionally in a leather or fabric design. The armrests are made of leather; if the office chair has a fabric cover, they are covered in black leather. Dexter has a steel tube frame with a diameter of 22 mm, powder-coated aluminium coloured, black or chrome. Dexter can be stacked up to five chairs high. Stacking trolley.